From the assembly line of automobile manufacturing industries to the telesurgery robots in space, Robotic Arms are to be found everywhere. The mechanisms of these robots are similar to a human which can be programmed for similar function and increased capabilities. They can be used to perform repeated actions faster and accurate than humans or can be used in harsh environments without risking human life. We have already built a Record and Play Robotic Arm using Arduino which could be trained to do a particular task and made to repeat forever. 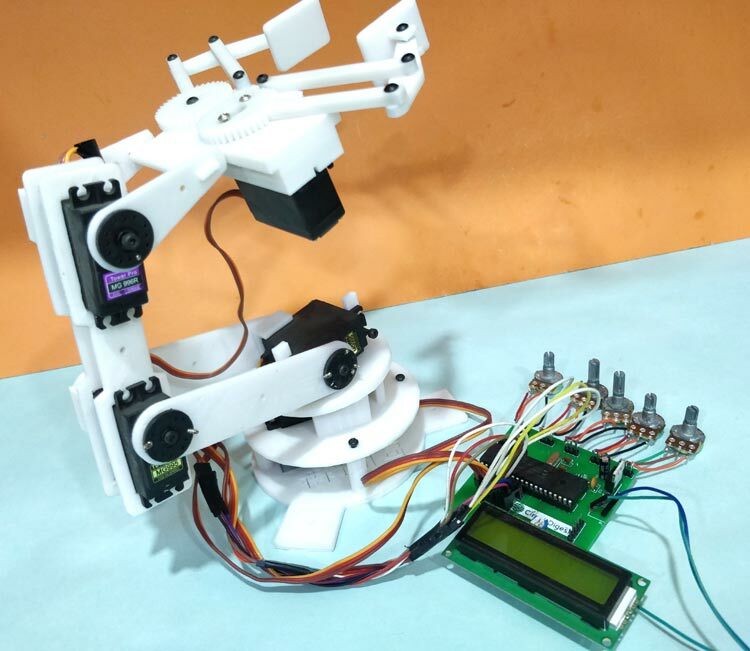 In this tutorial we will use the industry standard PIC16F877A 8-bit Microcontroller to control the same robotic arm with potentiometers. The challenge with this project is that PIC16F877A has only two PWN capable pins, but we need to control about 5 servo motors for our robot which requires 5 individual PWM pins. So we have to utilize the GPIO pins and generate PWM signals on PIC GPIO pins using the timer interrupts. Now, of course we could upgrade to a better microcontroller or use a de-multiplexer IC to make things a lot easier here. But still, it is worth giving this project a try for the learning experience. The mechanical structure of the robotic arm that I am using in this project was completely 3D printed for my previous project; you can find the complete design files and assembling procedure here. Alternatively, if you do not have a 3D printer you can also build a simple Robotic Arm using cardboards as show in the link. Assuming that you have somehow got hold of your robotic Arm lets proceed into the project. The Complete circuit diagram for this PIC Microcontroller based Robotic Arm is shown below. The schematics was drawn using EasyEDA. The circuit diagram is pretty simple; the complete project is powered by the 12V adapter. This 12V is then converted to +5V using two 7805 Voltage regulators. One is labeled as +5V and the other is labeled as +5V(2). The reason for having two regulators is that when the servo rotates it pulls in a lot of current which creates a voltage drop. This voltage drop forces the PIC to restart itself, hence we cannot operate both the PIC and the servo motors on the same +5V rail. So the one labeled as +5V is used to power the PIC Microcontroller, LCD and Potentiometers and a separate regulator output which is labeled as +5V(2) is used to power the servo motors. The five output pins of the potentiometers which provide a variable voltage from 0V to 5V are connected to the analog pins An0 to AN4 of the PIC. Since we are planning to use timers to generate PWM the servo motors can be connected to any GPIO pin. I have selected pins form RD2 to RD6 for the servo motors, but it can be any GPIO of your choice. Since the program involves a lot of debugging, a 16x2 LCD display is also interfaced to portB of the PIC. This will display the duty cycle of the servo motors that are being controlled. Apart from this I have also extended connections for all GPIO and analog pins, just in case if any sensors need to be interfaced in future. Finally I have also connected the programmer pin H1 to directly program the PIC with pickit3 using the ICSP programming option. Once the circuit is ready we have to figure out how to generate PWN signals on the GPIO pin of PIC to control the servo motor. We have already tired something similar using the Timer interrupt method and were successful. Here we are just going to build on top of it, so if you are new here, I would strongly recommend you to read this previous tutorial before proceeding further. All hobby servo motors work with a frequency of 50Hz. Meaning one complete pulse cycle for a servo motor will be 1/50 (F=1/T) which is 20ms. Of this complete 20ms the control signal is only from 0 to 2ms while the rest of the signal is always off. The below figure shows how the ON time varies only from 0 to 2ms to rotate the motor from 0 degree to 180 degree of the total 20ms duration. With this in mind we have to write the program in such a way that the PIC reads in 0 to1204 from the potentiometer and maps it to 0 to 100 which will be the duty cycle of the servo motor. Using this duty cycle we can calculate the ON time of the servo motor. Then we can initialize the timer interrupt to overflow at a regular interval such that it acts similar to the millis() function in Arduino. With that, we can toggle the status GPIO pin to be high for a desired duration and turn it off after 20ms (one complete cycle) and then repeat the same process. Now, that we have understood the logic let us get into the program. Like always the complete program with a Video can be found at the end of this page, code can also be downloaded from here with all the necessary files. In this section we will discuss the logic behind the program. The program employs the ADC module, Timer Module and LCD Module to control the Robotic Arm. If you are not aware of how to use the ADC features or Timer features or to interface an LCD with PIC, then you can fall back to the respective links to learn them. The below explanation is given assuming that the reader is familiar with these concepts. Of the total 0ms to 2ms control window of the servo motor we can control it with a resolution of 0.05msec, which allows us to have (2/0.05) 40 different positions for the motor between 0 degree to 180 degree. You can decrease this value further if your MCU could support it to obtain more positions and precise control. Now that we have the Timer 0 set to over flow for every 0.05ms, we will have the TMR0IF interrupt flag set for 0.05ms. So inside the ISR function we can reset that flag and increment a variable called count by one. So now this variable will be increment by 1 for every 0.05ms. Next we have to calculate the duty cycle and on time for all five servo motor. We have five servo motors each of which is used to control individual section of arm. So we have to read the ADC value of all five and calculate the duty cycle and on time for each. The ADC value will be in range of 0 to 1024 which can be converted to 0% to 100% duty cycle by simply multiplying 0.0976 (100/1024 = 0.0976) to the obtained value. This 0 to 100% duty cycle has to be then converted to ON time. We know that at 100% duty cycle the ON time has to be 2ms (for 180 degree) so multiplying 0.02 (2/100 = 0.02) will convert 0 to 100 duty cycle to 0 to 2ms. But then our timer variable count is set to increase once for every 0.05ms. This means that value of count will be 20 (1/0.05 = 20) for every 1ms. So we have to multiply 20 with 0.02 to calculate the exact on time for our program which will give us the value 0.4 (0.02*20 = 0.4). The code for the same is show below, you can see it repeated for 5 times for all 5 pot using a for loop. The resulting values are stored in the T_ON array. We cannot control all five motors together as it will make the ISR code heavy slowing down the entire microcontroller. So we have to rotate only one servo motor at a time. To select which servo to rotate the microcontroller monitors the ON time of all five servo motors and compares it with it’s previous on time. If there is a change in the ON time then we can conclude that the particular servo has to be moved. The code for the same is shown below. We also print the servo duty cycle on the LCD screen so the user could be aware of its current position. Based on the change in ON time the variable servo is updated with numbers from 0 to 4 each representing individual motors. We have reversed the bit value using the logic inverse (~) operator and then have performed a AND (&) operation on the PORTD to turn off only the desired pin while leaving the other pins in their previous state. The complete code snippet is shown below. We know that the total cycle has to last for 20ms before the GPIO pin is turned on again. So we check if the count has exceeded 20ms by comparing the value of count with 400 (same calculation as discussed above) and if yes we have to initialize the count to be zero again. It is always better to simulate the code before taking it to the real hardware. So I used Proteus to simulate my code and verified it to work correctly. The circuit used for simulation is shown below, We have used an oscilloscope to check if the PWM signals are being generated as required. Also we can verify if the LCD and Servo motors are rotating as expected. As you can see the LCD displays the duty cycle of motor D to be 07 based on the pot value which is the 3rd motor. Similar if another pot is moved the duty cycle of that pot and its motor number will be displayed on the LCD. The PWM signal shown on the oscilloscope is shown below. The total cycle period is measured to be 22.2ms using the cursor option on the oscilloscope, which is very close to the desired 20ms. Finally we are sure that the code works, so to continue with the circuit we can either solder it on a perf board or use a PCB. It will not work easily on breadboard because the POT always tends to give some problems due to poor connections. To design this PIC Robotic Arm, we have chosen the online EDA tool called EasyEDA. I have been using it for a long time now and find it very convenient because of its vast availability of footprint and easy to use nature. After designing the PCB, we can order the PCB samples by their low cost PCB fabrication services. They also offer component sourcing service where they have a large stock of electronic components and users can order their required components along with the PCB order. Using this link you can directly order the same PCB that we are using in this project and use it. Once the design is complete the board can be viewed as 3D model which will be very much helpful in visualizing how the board would appear after fabrication. The 3D model of the board that we are using is shown below. Apart from this you can also view the top and bottom layer of the board to check if the slick screen is as expected. 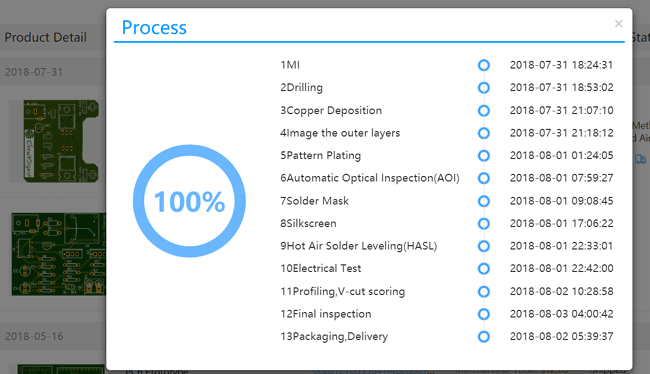 After ordering the PCB, you can check the Production Progress of your PCB with date and time. You check it by going on Account page and click on "Production Progress" . And after getting these pieces I have soldered all the required components over the PCB. I also directly soldered the POT directly instead of using connecting wires because the female to female wires that I initially used where giving weird analog output voltages probably because of loose contacts. Once all the components were assembled my PCB looked something like this. You might have noticed that there is only one 7805 on this board. That is because initially I thought I could get away with just regulator for powering both PIC and servo motor and later I realized I need two. So I have used an external circuit to power the servo motors through the green wires you see here. Nevertheless you don’t have to worry much about it because; I have made the changes to the PCB now. You can make use of the modified PCB and solder both the regulators on board itself. After all the tiring work it is time for pay off. Solder all the components on the board and upload the program to the PIC controller. Complete Code is given below or can be downloaded from here. The programming connector provided on the board should help you upload the program directly using Pickit 3 without much hassle. Once the program is uploaded you should see the LCD displaying the servo that is currently being controlled. To learn more about programming the PIC Microcontroller, just follow the previous tutorial. From there you can simply turn the pot and check how the servo motors respond each potentiometer. Once you understand the format you can control the robotic arm to perform whatever action you need it to perform and have fun. You can find the complete working of the project in the video linked below. That is it guys hope you understood the project and learnt something new from it. If you have any questions leave them in the comment section or use the forums for other technical discussions.